We have limited quantities of the jerseys and are selling them now for $75.00. The jerseys are custom made for us by Hincapie Sporstwear with their best technical materials in their Colombian factory. The jersey purchase page is up and running, they’re en route to Amazon, and you can also buy them at Elliott Bay Bicycles. 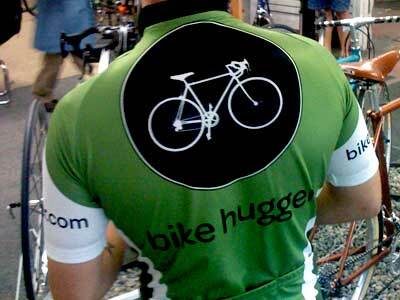 Please note that Hincapie Sportswear is sized for “a slimmer athletic fit.” That means it’s a snug jersey. The sizing matches the chart , but an XL is not for the Clydesdale class. If you want a less form-fitting size, order the next size up. We don’t have any models on staff here at Hugga HQ, but we’ll get some studio shots from our photog friends and upload them. Now if there’s any problem with the construction of the jerseys, contact us and we’ll work it out.